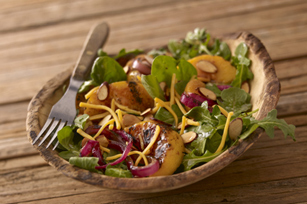 This mixed spinach-arugula salad for two is as sweet as it is savoury, with fresh grilled peaches and a yummy raspberry dressing. Brush onions and cut sides of peach halves evenly with 1 Tbsp. dressing. Grill peaches 6 min., turning occasionally and adding onions to the barbecue after 2 min. Cool slightly. Slice peaches; separate onions into rings. Combine spinach and arugula; place on platter. Top with peaches, onions, cheese and nuts. To toast nuts in the microwave, spread nuts onto bottom of shallow microwaveable dish. Microwave on HIGH until fragrant and crisp, stirring every 30 sec.